Further to this code update post earlier this year and this public pages go responsive post last year, I am happy to announce that the member section of Golf Predictor has now also finally gone responsive. This means that all site pages will now display better on screens of all sizes, from large monitors down to mobile phones. Before now, these pages would only display properly on screens with a minimum width of about 800 pixels, but now they adapt to much smaller screen sizes (to a minimum of 320 pixels, which corresponds to an iPhone 4 screen in portrait mode, for example). This was done to provide a better experience for users of mobile devices. 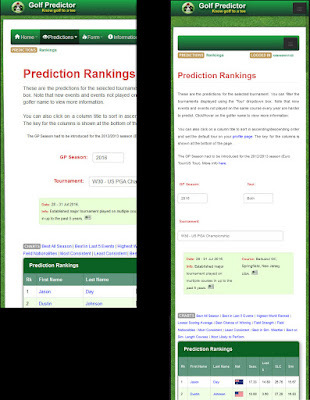 The results can be seen in the screenshot above, which shows the main prediction page on a device 320 pixels wide. The old Prediction Rankings page is shown on the left and is truncated, with users having to swipe/scroll to see all the page. On the right, the new responsive Prediction Rankings page is shown, with the content resizing to fit the screen. Note that, like before, the two menus are replaced by the so called "hamburger" icons, which provide a dropdown menu when clicked on smaller devices. Note also that the data table appears truncated on the new responsive page. The whole table is actually available via a simple swipe (on a mobile device) and this is explained in point two below. Despite the fact that the site looks almost identical to before on larger devices (e.g. computer monitors), a lot of niggly CSS work had to be done to get it to scale down to the smaller devices! Some minor compromises had to be made in some instances, but users on wide screens should not notice any difference from before (except for the Season Segment panel - see point six below). There were two choices when it came to dealing with the wide data tables on Golf Predictor. I could either drop columns on smaller devices or add scrolling to allow users to access all the information on the smaller page. I went with the latter option as it offered no loss in information and it was much easier to implement! On a mobile device, the entire table can be viewed with a simple left or right swipe.This also applied to the many charts on the site, which also use a scrollbar on a small screen rather than being squashing down to a very small size. Further to the above point, most mobile devices do not display scroll bars when wide content is displayed. Therefore, it can be difficult to know if there is more content or not without actually flicking the content in question. Depending on the (width of the) values returned, scroll bars may now be displayed on some data tables (e.g. on the compare pages) in full screen mode.The font size has been reduced on certain data tables to minimise the chances of this happening. With the plethora of mobile devices of varying sizes, it is not possible to cater for or test on them all. I have tested the site on a computer, an iPhone 4, a 2012 Nexus 7 tablet (Android Lollipop) and a Galaxy Note 4 phone (Android Marshmallow). Changing from portrait to landscape (or vice versa) on a mobile device can sometimes result in having to pinch to display the page at the correct zoom level. On investigation, this was ultimately caused mainly by the text pop ups on the site. Therefore, I have either decreased the width of such pop-ups on mobile devices or, in some cases, removed the pop-up text. For example, in the Season Segment panel on the Prediction Data page, I have removed the pop-up text entirely and reformatted the panel. On some pages, e.g. the site home page, it's not feasible to remove the text pop-ups, so this issue may persist on such pages. The position of some pop-ups have also had to be adjusted to optimise the display across all devices. The biggest issues with the smaller screens are with the pop-up charts. When clicking on one, you may have to scroll up if you see a darkened screen (this is the background for the pop-up window). In addition, I had issues with the pop-up charts on Safari on my old iPhone. Scrolling on the data tables worked fine, but scrolling in the modal pop-ups didn't work at all. After much ado, I was finally able to get them to work in an acceptable manner. It is not recommended to look at the pop-up charts in landscape mode on a small mobile device (e.g. a phone). Depending on the size of the device, you may not be able to access the Close button on the bottom of the pop-up. However, you should still be able to close it with the X button on the top right of the pop-up. A lot of work has gone into updating and testing the member section on the above mentioned devices. Every single page in the member section has been updated and I have carried out extensive testing. It is possible a page slipped through the cracks or your particular device displays a page differently. Please contact me immediately if you experience any layout issues on the site. You may have to refresh a page to see the changes, if you have viewed it recently. Overall, this improves the appearance of the member section pages across all devices. However, due to the many stats tables, panels and charts on the site, it is still recommended to use a larger screened device (and a PC in particular!) to use Golf Predictor. The predictions and statistics for this week, the Made in Denmark (European PGA Tour) and The Barclays (US PGA Tour), are now available on Golf Predictor. It's the first week of the lucrative FedEx Cup play-offs on the US PGA Tour and once again, there is still an impressive line up for the event. Danny Willett is the only top ten player in the world not teeing it up at Bethpage Black. That doesn't leave much top talent for the European Tour event in Denmark, but there are several players in both fields trying desperately to impress their Ryder Cup captain ahead of his wild-card choices! Paul Peterson (ranked 65th by Golf Predictor) won the D+D REAL Czech Masters on the European PGA Tour. The 28 year old American left-hander won his maiden tour title by a single shot over defending champion Thomas Pieters. The top two were neck and neck on the final day, but Peterson took the title in style with a long birdie putt on the par four last after Pieters had hit in close in two. Our top ranked player, Andy Sullivan, had a disappointing week while trying to cement his Ryder Cup place and missed the cut. Overall, in an event where many of the bigger names didn't perform, we had only eight of the top nineteen plus ties (8/26) in total. Si-Woo Kim (ranked 41st by Golf Predictor) won the Wyndham Championship on the US PGA Tour. The 21 year old South Korean won his maiden title with an impressive display at Sedgefield Country Club. After just missing out on a magical 59 on Friday, Kim showed great composure over the weekend and capped his performance with a closing birdie for a five shot winning margin over Luke Donald. Our top ranked player, Patrick Reed, finished in tied 22nd and we had thirteen of the top twenty two plus ties (13/32) in total. The predictions and statistics for this week, the Wyndham Championship (US PGA Tour) and the D+D REAL Czech Masters (European PGA Tour), are now available on Golf Predictor. There are not many big names competing in America this week, with the Wyndham Championship coming between the Olympics and the first FedEx Cup play-off event next week. However, a few Ryder Cup hopefuls are turning up, along with a host of middle tier guys trying to improve/maintain their place in the FedEx Cup standings. Meanwhile, the field in the Czech Republic is not quite as impressive, with only three members of the top fifty in the world playing in Prague. Justin Rose (ranked 5th by Golf Predictor) won the Olympic Men's Golf Competition on the European/US PGA Tour. The 36 year old Englishman became the first Olympic golf champion in 112 years by edging out Henrik Stenson on an exciting final day in Rio. The duo were neck and neck all day, but a birdie on the last by Rose and a sloppy bogey by Stenson saw the gold medal go to the Englishman. American Matt Kuchar finished strongly with a 63 (-8) to secure the bronze medal. Stenson was our top ranked player and we had thirteen of the top twenty (13/20). Ryan Moore (ranked 5th by Golf Predictor) won the John Deere Classic on the US PGA Tour. The 33 year old American won his fifth tour title by keeping mistakes to a minimum at damp TPC Deere Run. Leading by one overnight, Moore was never seriously threatened during the final round and closed out a two shot victory over Ben Martin. Moore played the last 46 holes bogey free and only had two for the entire tournament. Our top ranked player, course specialist Zach Johnson, fell back to tied 34th after a good opening round. In the weather affected event where most of the bigger names didn't perform, we had only four of the top sixteen plus ties (4/21). The predictions and statistics for this week, the John Deere Classic (US PGA Tour) and the Olympic Men's Golf Competition (European/US PGA Tour), are now available on Golf Predictor. After all the controversy, the Olympics is finally upon us and despite the disdain shown by many top pros, I have decided to cover the golf competition. Not many big names in Illinois, where Zach Johnson is headlining the field. However, there are a few big names in Rio, but many of the big guns are cowering in fear of the Zika virus and that 500,000:1 chance of contracting it! Anthony Wall (ranked 22nd by Golf Predictor) won the Aberdeen Asset Management Paul Lawrie Match Play on the European PGA Tour. The 41 year old Englishman finally won his second tour title with a one hole victory over Alex Noren. Despite playing against a man in great form, Wall overcame the loss of the opening two holes on a very windy final day to win for the first time in over sixteen years. Our top ranked player, Chris Wood, lost at the last sixteen stage in the restricted field match play event. Russell Knox (ranked 7th by Golf Predictor) won the Travelers Championship on the US PGA Tour. The 31 year old Scot also won for a second time in both his career and on the 2015/16 PGA Tour season with a one shot victory over Jerry Kelly. On a strange day dominated by the historic 58 (-12) by Jim Furyk, Knox proved to be player who tried not to win the least! He still needed a clutch twelve foot putt at the last for a winning sand save, though. Our top ranked player, the defending champion Bubba Watson, finished in tied 25th and we had twelve of the top seventeen plus ties (12/24) in total. The predictions and statistics for this week, the Aberdeen Asset Management Paul Lawrie Match Play (European PGA Tour) and the Travelers Championship (US PGA Tour), are now available on Golf Predictor. After the excitement of the US PGA Championship, it's back to the grind! Unusually for a week after a major, there are a fair number of the top protagonists from Baltusrol teeing it up this week as the countdown to Ryder Cup selection continues. Interestingly, there's a Koepka in both fields this week: Brooks is entered in the US event while younger brother Chase is in the European field! Although Golf Predictor is designed primarily for stroke play events, the match play event in Scotland has also been put through the prediction engine.